DCist reports on a private party at Flashpoint which ended with some artwork being destroyed. A few days ago I posted about a memo by Luis A. Luna, Assistant Administrator, Office of Administration and Resources Management, who announced a decision to install a temporary screen in two days. The screen will cover up five historical murals (out of 25 in the building) on the 5th floor of the Ariel Rios building in Washington, DC. 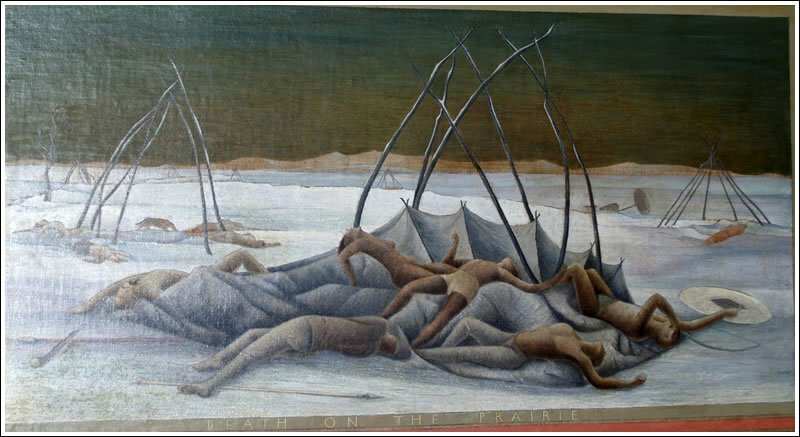 These murals were created under a 1934 U.S. Treasury art commissioning program. I'm still mulling about how to express my opinion on this issue... meanwhile here are a couple of the murals; click on them for a larger view. The six murals which will be covered up, and which have titles such as "French Explorers and Indians," "Torture by Stake," "The Red Man Takes the Mochila," etc. depict a diverse set of panoramas ranging from spectacular scenes of the often violent interaction between the American West’s native nations and the new settlers, to artistic recreation of historical meetings between European explorers and native Americans. Nearly the entire world was aghast when the Taliban destroyed the gigantic Buddha sculptures that were offensive to that repressive regime, and we all condemned the demolition as a vile and barbaric act of cultural ignorance and artistic destruction. And yet here we are almost ready to do the same to an integral, if not proud, part of our historical and artistic past. I have had many opportunities to sit on the advisory board of the DC Commission on the Arts and Humanities, and in that process I have help to fund many of the contemporary murals that now adorn our nation’s capital. 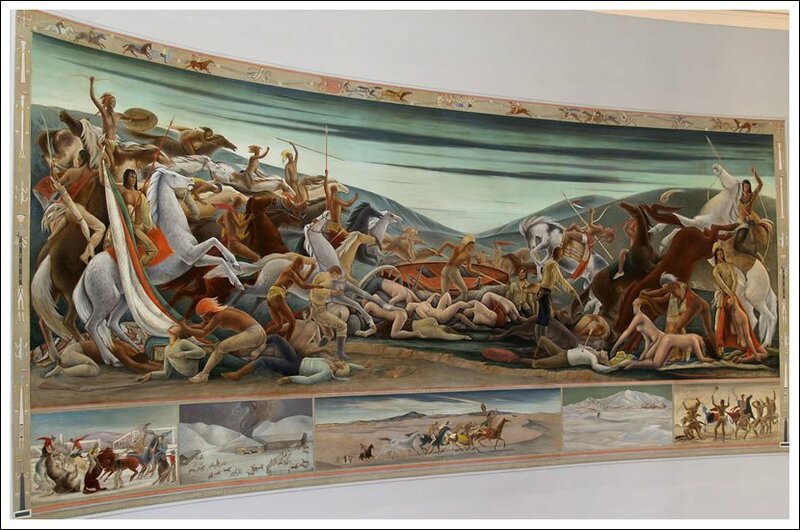 In that position, I have no doubt in my mind that there is no arts commission or city in our nation that would remotely consider funding these 1930s murals in 2006, much less in a public building. That is just the nature of where we were in 1930 as a people and where we are now. But it is my hope that decades from now, if someone finds any of the murals that we have funded in the last few years for our nation’s capital objectionable, that our future Americans will have more conviction and more common sense and more guts to stand fast rather than to immediately take the politically-correct and knee-jerk reaction to "cover" them up, or consider removing them.